The Israel Philatelic Service has issued a special Rabbi Nachman of Breslov stamp commemorating 200 years since his passing. The 'Always Joyful' anniversary package includes a CD of the Rebbe's songs, and an artistic album of his teachings for each month of the Jewish calendar. In its September 2010 anniversary folder (stamp sheet, CD and album), the Israel Philatelic Service commemorates the bicentennial of Rabbi Nachman of Breslov. 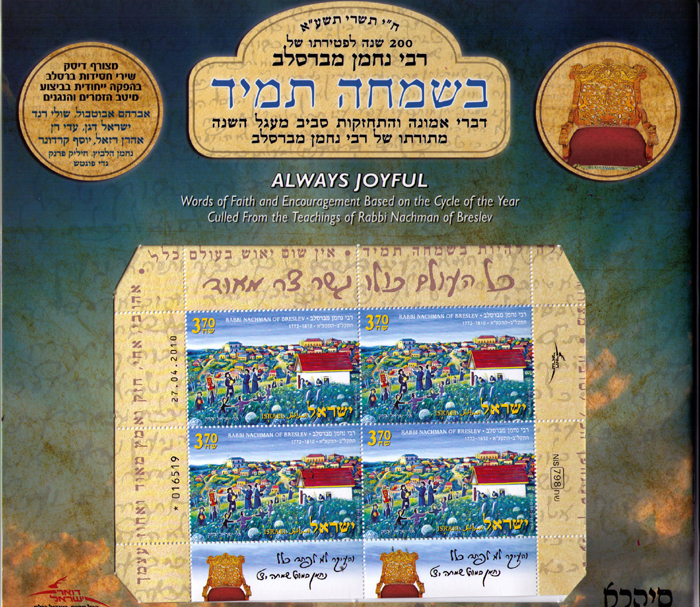 The special stamp issue features Breslov Hassid, Rabbi Yitzchak Bezanson's colorful portrayal of Nachman's followers flocking to the grave site in Uman, and is signed with Rabbi Nachman's words, All the World's a Narrow Bridge'. Rabbi Nachman's popular teachings of spiritual joy and brotherly love continue to inspire a broad spectrum of the Jewish world, religious and secular alike, and to feed the creative muses of artists, musicians and writers. The album and CD share the title, 'Always Joyful'. The colorful album in Hebrew and English is the creation of Rabbi Offer Gissin, who also edited 'Rabbi Nachman of Breslev' (pub. Yediot Ahronot) on Breslov Hassidim, Judaism, creativity and art. 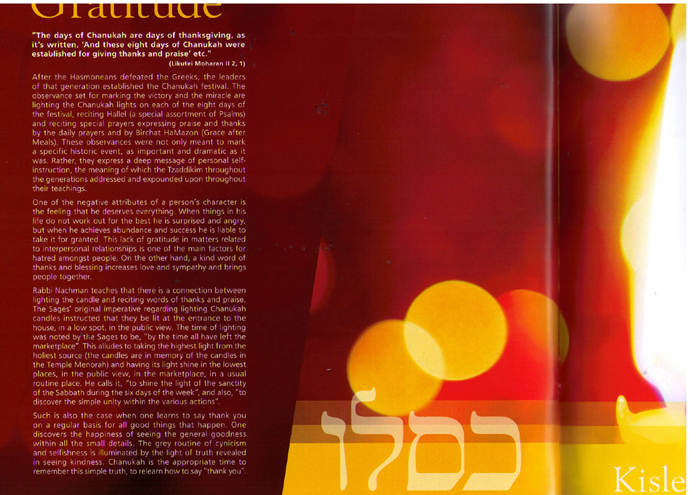 The album provides a page of Rabbi Nachman's spiritual insights for each month in the Jewish calendar. 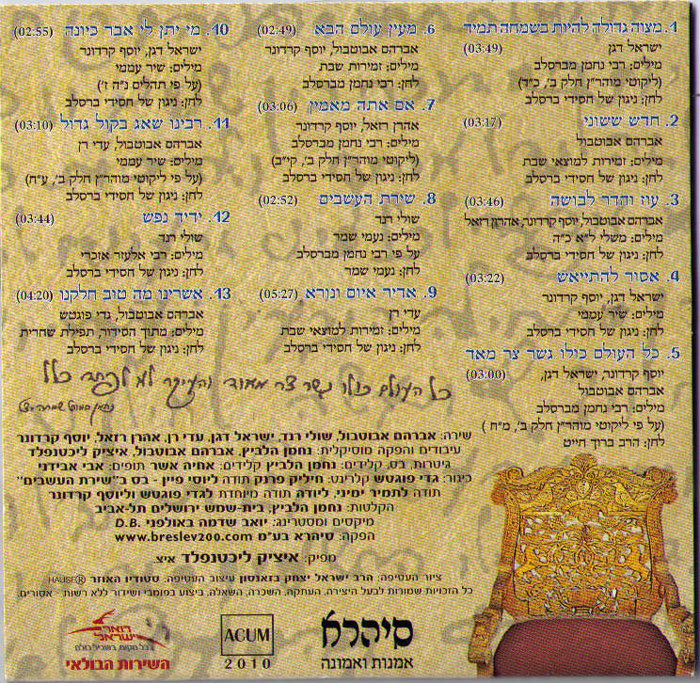 The album's theme of evolution of the soul from barrenness to fertility and from sadness to joy is taken from Nachman's famous saying, "It's a great mitzvah to be ever joyful". The complete Rabbi Nachman Anniversary package, with stamp sheet, album and CD, is your ideal souvenir gift for any festival or occasion throughout the Jewish year.